We use upholstery tools every day for wall upholstery project. All upholstery tools are selected for their strength, efficiency and durability. We do know how important it is to have reliable upholstery tools in our hands. For this reason, VE THOMAN recommends installers and upholsterers to look at them carefully. This handpicked choice of products is perfect for installing wall upholstery. We make them available to you. To see detailed description of each item and prices, visit the SHOP page. Wall upholstery installation is a trade performe by a qualified upholsterer. And the tools presented are good quality products. Therefore, possessing the proper upholstery tools is fundamental in making good work. The only tools needed are as shown below. We believe each installer should have a track cutter in his toolbox and one in the workshop. It is a powerful hand tool which has 3 great features. The cutter has a sharp blade, a long platform and a system of leverage making any cutting job so easy. You also will find the cutter useful for various applications. It is a very good investment and an important piece to have for cutting all the lengths of tracks. At the end of the day, I guarantee that you will like it so much more than other brand you have tried in the past. 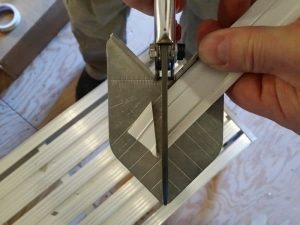 So, you don’t need to take out a miter saw on the job, no dust, no noise. What you hear is the click of the blade. What we really like is you are able to make very small pieces at whatever angle you wish. It means the waist is minimal on a job. Actually, we seldom put pieces of tracks in the trash. There is always a little place to use a few inches of tracks, like around a molding or a vent. If there is one tool to get, I would say definitively the track cutter, than the spatulas. These 2 spatulas are very practical during the process of installing fabric on walls. Ergo spatula and metal spatula have a special blade designed for fitting the fabric in the track. They equally do a good job. The third is bay leaf spatula which works very well in tight spaces. The forth named plastic spatula works as well on the track but just at the end. When the fabric is trim close to the molding exposing edge. This spatula does not damage these edges. To summarize, we have altogether 5 items in the catalog which a sold separately. 1 cutter for cutting the tracks to the desire length and 4 spatulas working in the tracks. Not long ago, we added a Deluxe upholstery tool kit. It includes 5 great spatulas. A Deluxe package made for busy wall upholsterer. Another really neat tool is speed roller. It is not a tacking tool. The rolling blade runs fast pushing the fabric in the track at the last stage. This tool works in straight line. Like all tools for should be careful if you have very fine fabric. Other equally important tools are staplers which you may already have. You will find a small choice of electric upholstery tools. Long Nose Staplers are items for sale in this website. Again, those staplers will help in many other handy work. Upholstery tools mentioned above are chosen for installing a very unique track system. Some of you have already upholstery tools which is fine. But, remember we got everything for you ever need it. If you wish to save yourself some time and effort, consider checking them out. It is time well spend! Go to our Houzz page to see more info or on our Facebook page. All projects presented have in commun this exclusive track. And each room has fabric fitted with these upholstery tools. We also have a channel on YouTube.